Can I let you in on a little secret, or two? My Capstone project has taken a back burner in the last two weeks. I came down with a nasty cold that had me snifflin' and sneezin' my way around my apartment, but I am on the mend! The other secret is that this semester has been immensely hard for me. I signed up for two very amazing very challenging classes, and my Capstone has been this thing that I do when I need a break from the other two classes. In reality, I wish my Capstone was something I had way more time to devote to, but lately it's been pushed further and further down my (never-ending) To Do list. December, I see you, and you have Capstone written across your forehead. Do not take an excruciatingly hard class your third semester. You will not have the time for it because you will need to be working on your Capstone. I had her advice in mind, then when I saw the course offerings for the fall, I told myself "Pshhh, I can do it. I can do it all!!" And so I signed up for what I will officially title "The Hardest Class of My Entire Life" and all I can say is - I am challenged to my core. 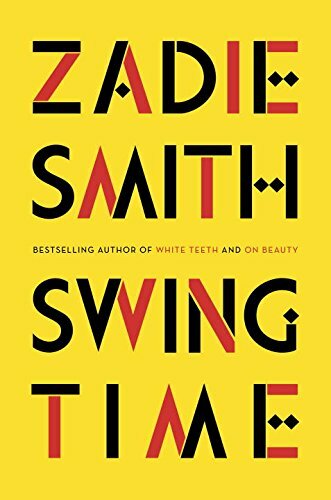 I'm learning an immense amount, reading copious amounts of literature, and growing each week. I've even tried to find a way to link up my research for my Capstone to my final project research for this class, focusing on Jane Addams and the Progressive Era take on disability. The point of these posts is to be honest, with myself and with any of you readers who care to know (thank you dear readers). And if we're being completely honest here, I'm going to come out and say it. This semester is really really different and really really hard. The glitz and glamour of visiting one or two museums a week has evaporated. Not working in galleries means I'm way more disconnected from my art world circuit. But worst of all, not being in any required MUSE classes means I see a lot less of my beloved 2016 cohort. The crew I grew to know and admire, the group that challenged me and rolled their eyes at all the right times. I have classes on Monday and Wednesday with two of my grad school besties, but I'm really missing the comfort of being around the folks I grew so close with. I've come to the conclusion that while going to a big research university has it's perks (like so many classes to choose from, great opportunities for growth, amazing faculty, a Wendy's for when I need fries), it's also really easy to feel lost in the sheer size of the place. Coming from the small undergraduate bubble that was my beloved Knox College, where everyone knew everyone, and I was nestled comfortably into my department, being at UIC is something that is really foreign to me. The campus feels huge, particularly because all of my classes this semester are on a different side of campus. In a nutshell, this semester is strange and new and difficult, but we've passed the halfway marker! I just need to power through is all! A snap of my crew from last semester. I reflect so fondly upon my time last year. First year MUSE-life is an absolute dream. We sit in circles, we go on behind the scenes tours of museums, sometimes we bring snacks to class, and there's usually some sort of a visitor from the museum world. I'm so lucky to have been able to go through this immersive, inclusive, challenging, and hands-on year! So back to my Capstone... This coming week has a bunch of deadlines and due dates for my electives. I've turned my attention to those to get through this crunch, but after this week I am going full-Capstone. But I have done a few good things. I have done some reading, and I have written two of my three surveys. I've even started to build them on Survey Monkey! I attended a webinar on the inaccessibility of some of our most beloved social media platforms. Check this out: Facebook and Youtube are the pits in terms of access. The way the websites are formatted and laid out makes it almost impossible to navigate them with assistive technologies (like web readers). Twitter it turns out, is the most accessible and easy to adapt with assistive technologies. Having read this, I'm thinking it could be a worthwhile project to practice an audit of my own blog. One thing I want to do is start to include captions of my images that describe the image itself, in addition to the contextual caption (see above image). I also did my first and second audio tours as part of my study. 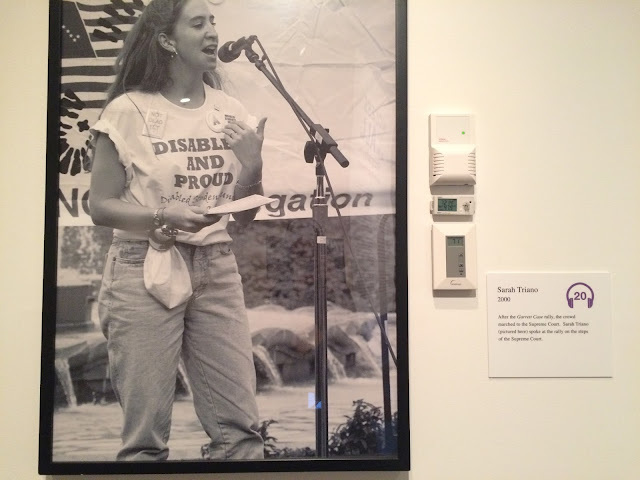 I visited the Chicago History Museum and moved through both their general audio guide and the audio description that was created specifically for Access for All: Tom Olin's Photographs of the Disability Rights Movement the ADA anniversary photography exhibit. I noticed the differences in the style and content in both of these tours, as well as the ease of use of the technologies (both were iPods, one was a shuffle, one was not), and if the content conveyed the overall message that a non-visual learned would need. Though the ADA accessible audio guide offered both a reading of the label and a description of the photograph itself. There could have been a little bit more pizzaz or energy to the overall recordings, but the show itself was great! I also noticed a mistake in the ADA audio guide - one of the tracks was omitted. I made sure to tell those administering the guides that this needs to be corrected ASAP! What is so exciting about seeing this photograph is that I actually interviewed Sarah Triano last spring as part of my research on the activist history of the Disability and Human Development and Disability Student Union at UIC. Triano was a leading activist in Chicago in the early 2000s, and helped to co-organize the Leave Out for Equal Justice Protest in spring of 2001. I read this article and am really excited to read about the more experimental and non-traditional ways that house museums can engage their visitors. I've ordered Vagnone's book already! In conclusion - rather than beat myself up on the woulda, shoulda, couldas, here's my ongoing to do list! Read "The Anarchist's Guide to House Museums"